The 1/2 in. Shark Bite Push-to-Connect x FNPT Adapter allows you to make a 90-degree connection to 1/2 in. pipe using a Push-to-Connect connection on one end and gives you a 1/2 in. Female NPT Adapter on the opposite end. Shark Bite fittings are the easiest way to join copper, CPVC or PEX pipe in any combination with no soldering, clamps, unions or glue. Just insert the pipe and the stainless steel teeth bite down and grip tight, while a specially formulated O-ring compresses to create a perfect seal. Disassembly is just as fast using the simple disconnect tool so fittings and valves can be easily changed and reused. They can even be rotated after assembly for easier installation in tight spaces. Shark Bite Fittings are certified for potable water supply and hydronic heating applications. Get Shark Bite and get a grip on your next plumbing project. The SharkBite PEX Plastic Barb x Male Adapter (5-Pack) is an easy to install, low cost solution to transition from a threaded pipe to PEX Pipe. 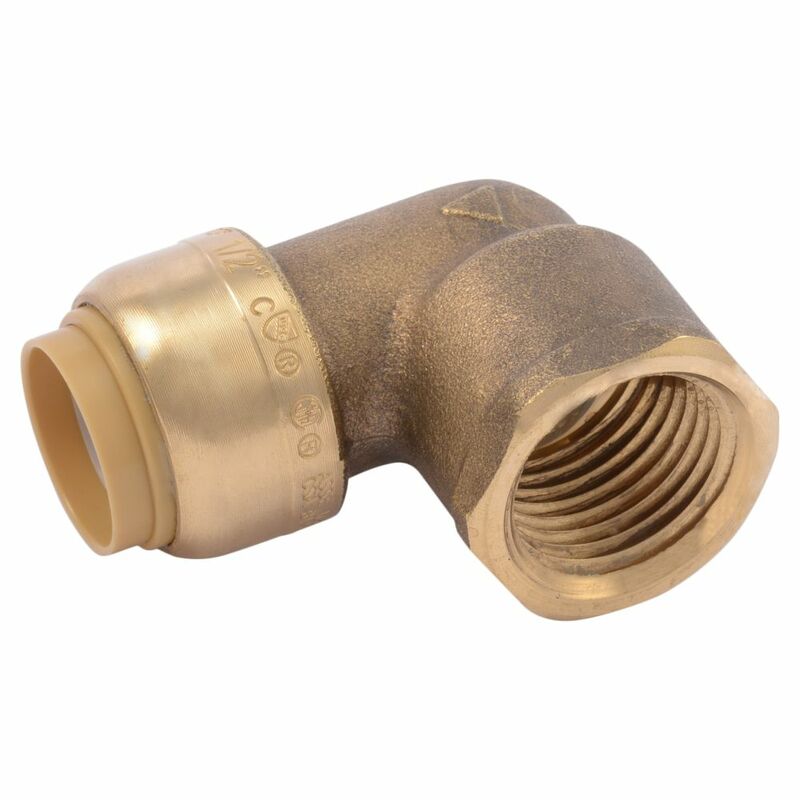 Advanced Polymer Plastic fittings are a perfect solution for areas where corrosion may affect DZR Brass Fittings. SharkBite PEX Plastic Barb fittings are suited for potable water distribution and hydronic heating applications. These PEX fittings may be used with the stainless steel clamp system or the copper crimp ring system (both sold separately). The SharkBite PEX Barb fitting range offers a wide variety of Fittings, Manifolds, Valves, clamp rings, crimp rings and tools in various sizes to help complete your next plumbing project. The SharkBite PEX Plastic Barb Plug (5-Pack) is an easy to install, low cost solution to cap off PEX pipe for pressure testing or permanent capping. Advanced Polymer Plastic fittings are a perfect solution for areas where corrosion may affect DZR Brass Fittings. SharkBite PEX Plastic Barb fittings are suited for potable water distribution and hydronic heating applications. These PEX fittings may be used with the stainless steel clamp system or the copper crimp ring system (both sold separately). The SharkBite PEX Barb fitting range offers a wide variety of Fittings, Manifolds, Valves, clamp rings, crimp rings and tools in various sizes to help complete your next plumbing project. Sb Elbow 1/2 Inch X 1/2 Inch Fnpt Rt Lf The 1/2 in. Shark Bite Push-to-Connect x FNPT Adapter allows you to make a 90-degree connection to 1/2 in. pipe using a Push-to-Connect connection on one end and gives you a 1/2 in. Female NPT Adapter on the opposite end. Shark Bite fittings are the easiest way to join copper, CPVC or PEX pipe in any combination with no soldering, clamps, unions or glue. Just insert the pipe and the stainless steel teeth bite down and grip tight, while a specially formulated O-ring compresses to create a perfect seal. Disassembly is just as fast using the simple disconnect tool so fittings and valves can be easily changed and reused. They can even be rotated after assembly for easier installation in tight spaces. Shark Bite Fittings are certified for potable water supply and hydronic heating applications. Get Shark Bite and get a grip on your next plumbing project. Sb Elbow 1/2 Inch X 1/2 Inch Fnpt Rt Lf is rated 4.8 out of 5 by 40. Rated 5 out of 5 by 203Tom from Sharkbite…the brand speaks for itself!... Sharkbite…the brand speaks for itself! Rated 5 out of 5 by HoustonRemodeler from This little beauty saved our butts today !! We had... This little beauty saved our butts today !! We had next to no room to work in the wall space behind the tub, but using this part made for an easy repair. Rated 5 out of 5 by rockwelrock from Worked great for me. Very easy and quick to use. Worked great for me. Very easy and quick to use. Rated 5 out of 5 by Geobug from This got me out of a jam! Great to... This got me out of a jam! Great to use!